Primrose Hill (2013) is a 12 month Block of the Month program featuring Marianne Elizabeth's newest collection, Arabella Rose. The quilt is available in 2 color options. Cream and Plum. Complete patterns are available now, as well as fabrics thru RJR Fabrics. The cutting size for the Fuschia fabric is missing for month 9. It does appear on the alternate cutting chart provided, Cutting Fabrics by Month, so please refer to that for appropriate size cut. This has been corrected Dec. 2012. Someone reported difficulty cutting out the Pine fabric (CREAM) which would be the Acorn fabric in the Plum colorway. There is enough fabric provided. First cut the (4) 4 1/4" squares, side by side. Then cut four strips that are 2 3/8" x 11". From these cut the (16) 2 3/8" squares. Proceed as directed. 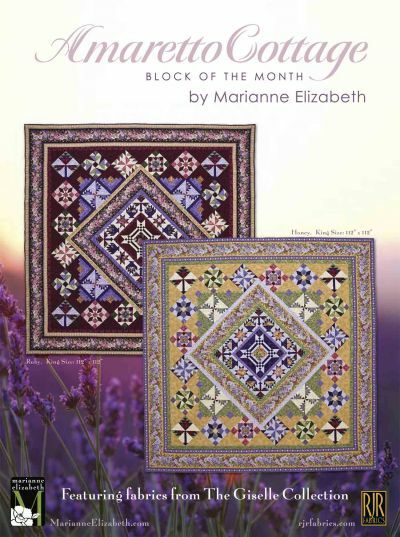 Amarretto Cottage (2012) is a 12 month Block of the Month program featuring Marianne Elizabeth's fabric collection, Giselle. The quilt is available in 2 color options. Ruby and Honey. WHOLESALE PURCHASE OF THESE FABRICS IS NO LONGER AVAILABLE. CONTACT YOUR RJR REP for fabric ordering information. ASK your rep about EVERYDAY QUILTS, Marianne's book, published by All American Crafts, the publishers of THE QUILTER MAGAZINE and FABRIC TRENDS. To place on online order for wholesale pattern purchase, you may use the retail shopping cart to place your order or email us and we will be in contact with you. On the last page, there is a very large text box in which you can right a lengthy remark. In the remarks, indicate WHOLESALE order. (Wholesale Orders are limited to legitimate retail business customers.) Minimum quantity per pattern 3, per order 12. Our cart does not auto bill your credit card. Your card will be billed at wholesale price. EVERY wholesale order is CONFIRMED BY EMAIL. If you have not received a CONFIRMATION, then we have NOT received your order!